An apple of the Deep South, Cauley arose in Mississippi prior to 1860. According to Calhoun (1995) the apple was “resurrected” in 1919 when a mature tree was found in Grenada, Mississippi. Several young trees were grafted from this old tree and planted at the Delta Branch Agricultural Experiment Station in Stoneville. Only one tree remained after the famous 1927 Mississippi River flood and thrived for many years afterwards producing an average of one ton of apples every year through the 1930’s. 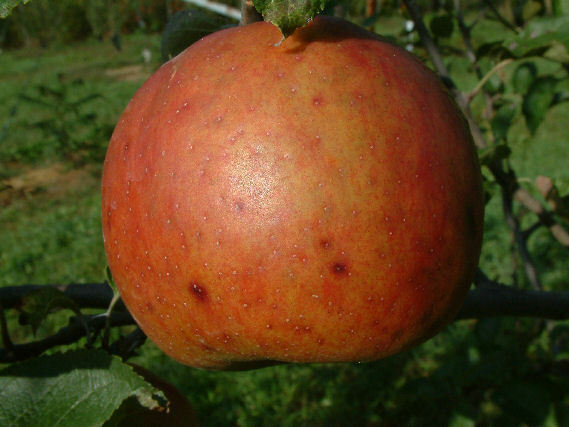 A high quality apple suitable for fresh eating or cooking. Fruit is large to very large, occasionally weighing over a pound. Skin is greenish-yellow with a slight blush or red striping. The yellowish flesh is crisp, juicy and flavorful. Ripens early August but can picked in mid-July for cooking and baking. Would like to buy a potted Cauley apple tree. Please tell me if you have them fir shipping now, and how much do they cost.